One scruffy little dog in search of a home. One lonely little boy who wants a pet. Will they be friends to the end? There was once a dog who had no name, and no home. The only thing he had was fleas – and they weren’t much company! This big-hearted mutt longs for a family, and one day he sees one that looks just right – with a brother and sister to play with him. But they don’t want to be friends! Instead, they shoo poor “Fleabag” away! And it’s only when the little boy runs away from home that our plucky little hound can find his way into their hearts, and finally find a home of his own… An adorably ragged hero tumbles through the pages of this quirky tale of friendship and finding a place to belong. Here’s a sweet picture of Fleabag for you to colour. 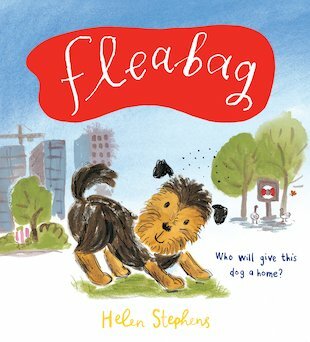 Helen Stephens won the Dundee Children’s Book Award for Fleabag and the Rotherham Children’s Book Award for How to Hide a Lion.